I think I’m ready. Just about. I may have been holding on to all things summer, but I’m starting to get that itch, that feeling that perhaps summer is starting to wear out its welcome. I almost feel guilty saying that, we’ve enjoyed a bounty of deliciousness this season. But it’s been so long since I’ve had the desire to fire up the oven, I actually want cold weather to return so I can start indulging in baking and roasting again. It doesn’t help that I saw some candy corn (!) at the grocery store the other day. We’re in that awkward stage, the adolescense of seasons. After a season of frivolity, it’s time to buckle down and get a little serious. Be homebodies again. But we’re not quite ready, and we still want to have that excuse to celebrate and have a good time, to soak in the last of the sun. So, I dipped my toe into baking again. Just a toe, it was 101 degrees, after all. I made some gougères, which is fancy-speak for cheese puffs. They look impressive, but really, are so, so simple. So here’s the thing. I didn’t make gougères just to bite into little pillows of cheesy dough (though really, that would be good enough reason). 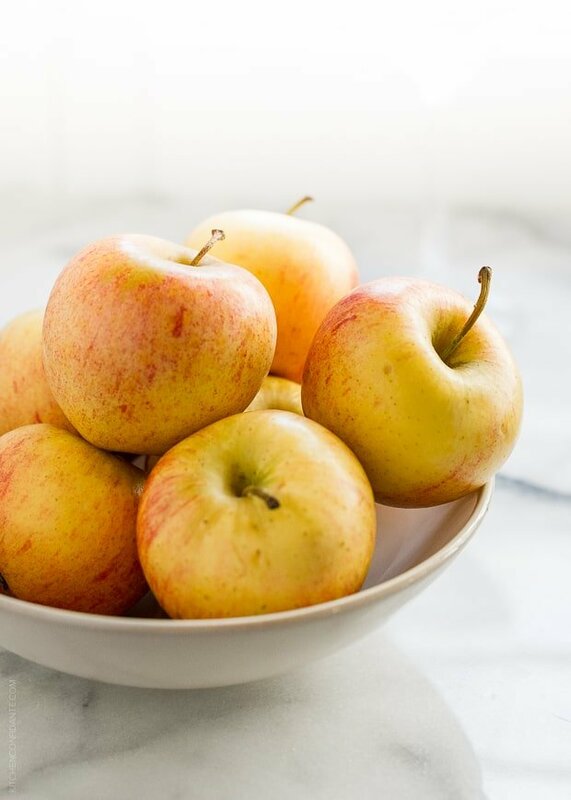 I wanted an appetizer to pair with a chilled glass of crisp hard cider – a drink that is the perfect segue between summer and fall. 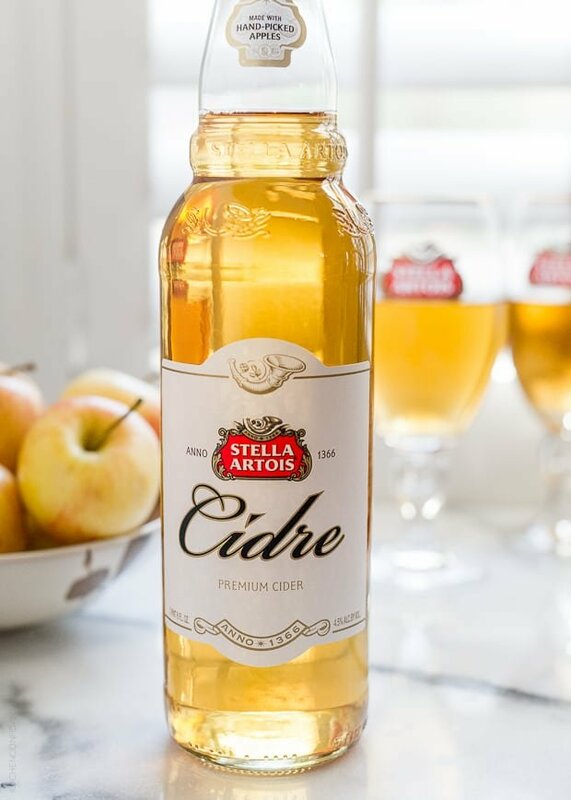 When I heard that Stella Artois released their take on a European cider made with fresh, hand-picked apples, I was definitely curious to try it. 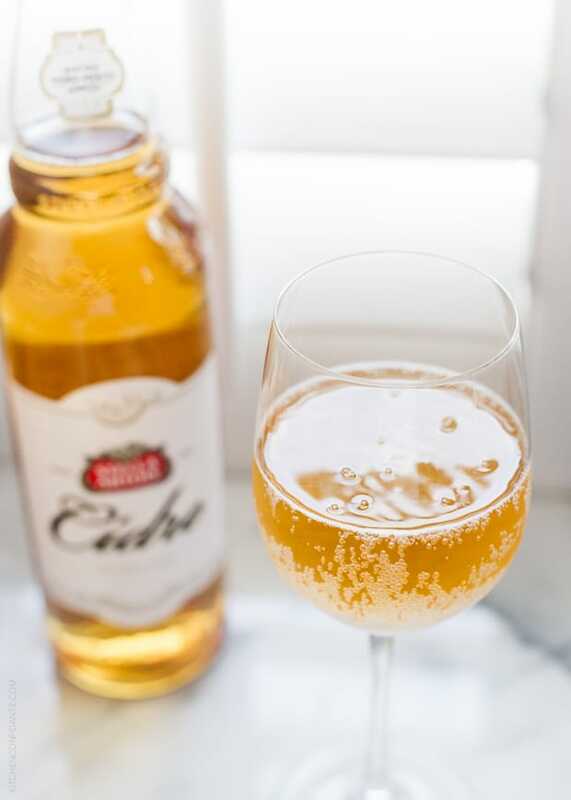 As I sought relief from the sweltering sun last weekend, I found Stella Artois Cidre so refreshing to sip as we settled into another hot late evening, drinking much like a crisp white wine. I’ll admit, it was a very nice change of pace from the usual glass of vino. As for the gougères, I took the warm puffs of cheesiness one extra step. Each was stuffed with a mound of sweetly spiced apple, cooked in Stella Artois Cidre, and topped with crisp slivers of prosciutto, for the perfect sweet and savory bite. 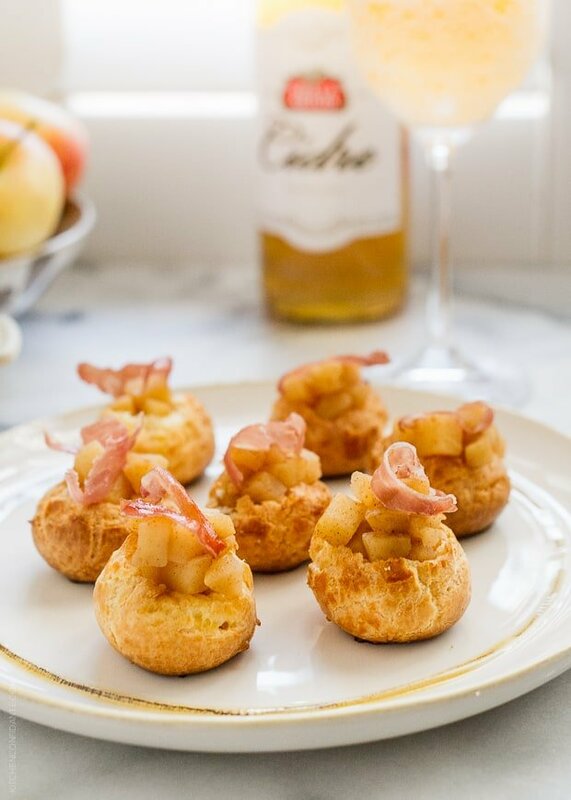 Apple Cheddar Gougères with Crispy Prosciutto paired so well with each sip! For now, my little baking bug has been satiated (in more ways than one!). We may be a few weeks away from cozy sweaters and pumpkin bread, and you know what, I’m okay with that. I think I’ll hold on to these warm summer evenings a wee bit little longer. If it means sneaking in small baking projects like this and sips of something cool and refreshing, summer can stay after all. Disclosure: Compensation was provided by Stella Artois via Glam Media. The opinions expressed herein are those of the author and are not indicative of the opinions or positions of Stella Artois. Sponsored posts such as these help support the work behind the scenes on Kitchen Confidante. Thank you so much for your visits and making my blog part of your day. This may have been made with grown-ups in mind, but the truth is, my children loved them too. What's not to love about apples and cheddar? The best part is most of the hard work can be made in advance, perfect for entertaining. Preheat the oven to 425 degrees F. Prepare two baking sheets by lining with a silicone baking mat or parchment paper. In a medium sauce pan, warm the skim milk, butter, salt and pepper over medium heat. Bring it to a bubble and whisk the butter until it is completely melted. Add the flour and using a wooden spoon, stir vigorously for about 5 minutes. It will be extremely thick and form into a ball. Place this into a food processor or the bowl of an electric mixer, add the eggs and cheddar cheese and pulse until it is creamy and fully combined. Using a tiny ice cream scoop or a pastry bag with a 1 inch tip (I prefer the ice cream scoop for ease, just dip in hot water periodically), place about 1 tablespoon sized mounds on the prepared baking tray, about 20 puffs per tray, with about 1 inch spaces between. If the mounds are not perfectly round, use a wet fingertip to lightly pat into shape. At this point, you can place your baking trays in the freezer to bake at a later point. Otherwise, continue by lightly brushing each puff with the egg wash, then bake in the oven for about 15-20 minutes, or until golden brown. Make the filling by melting the butter in a sauté pan over medium heat. Add the apples and stir in the cinnamon, all spice and ground clove. 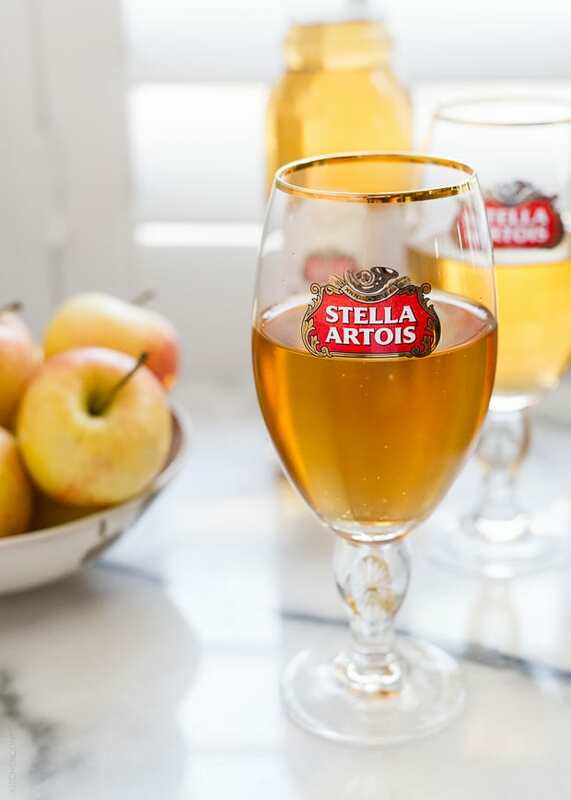 When the apples are fragrant, stir in the agave nectar and hard cider. Let the apples cook down until their are tender and the liquid is syrupy. Set aside. Crisp the prosciutto in a non stick skillet and set aside. 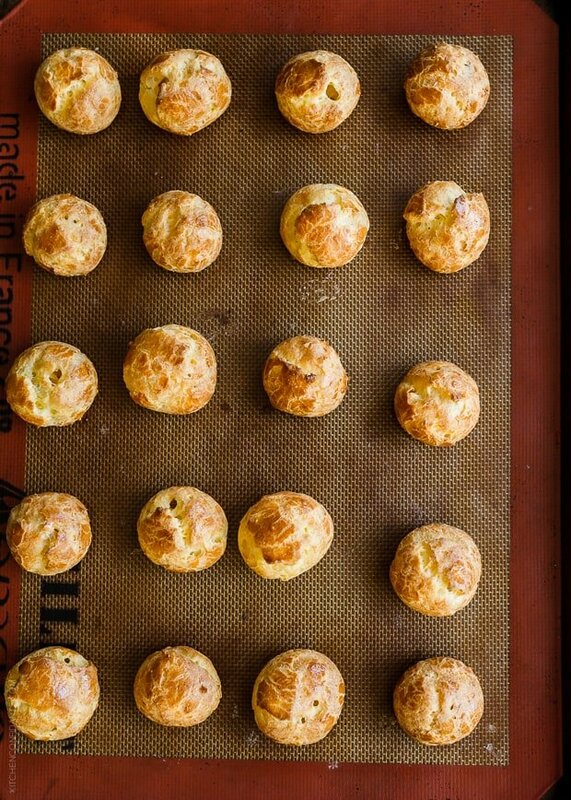 Assemble the gougères by removing the tops of the baked puffs, filling them with a teaspoon or two of apple and topping with a sliver of crisp prosciutto. Serve immediately. 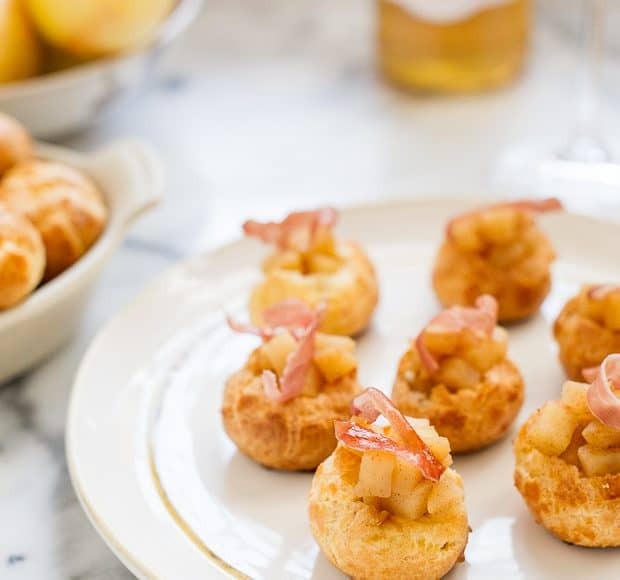 Inspired by and adapted from White Cheddar Gougeres, Apple Pulp, Prosciutto and Sage by Tyler Florence, via Food Network. Gougères recipe adapted from Cheese Puffs by Ina Garten, Barefoot in Paris (2004), via Food Network. 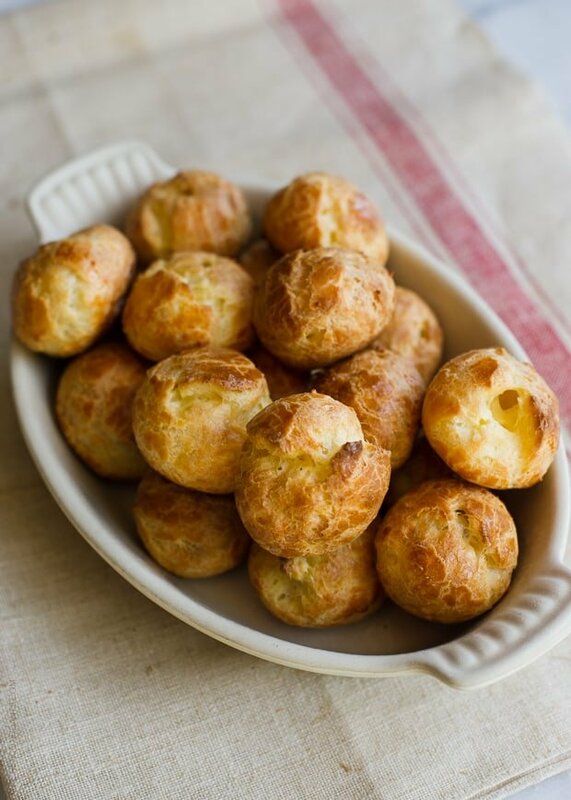 Your gougères are gorgeously golden; I adore these flavors! You had me at crispy prosciutto. Amazing! 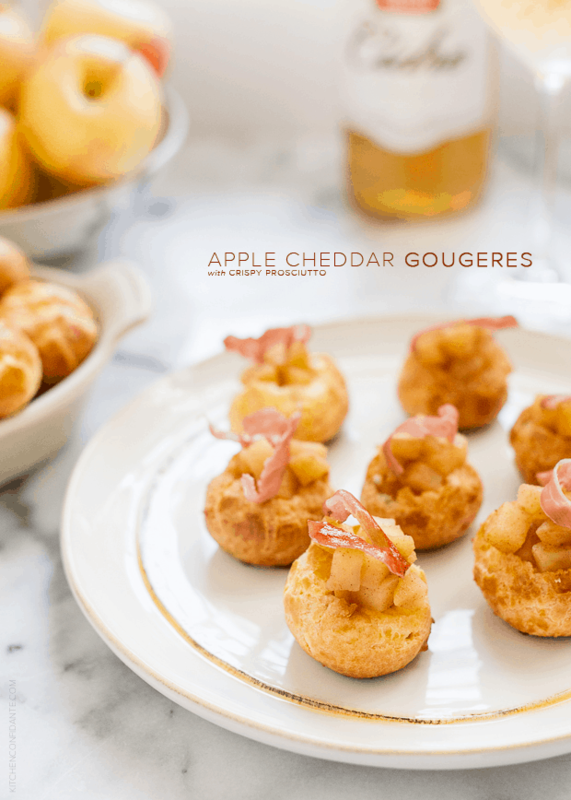 I can’t stop cooking with hard cider lately and these look divine! SO loving this recipe! I am obsessed with gourgeres and yours look perfect. Must try this Cidre! Lovely photos Liren! Yeah, I’d say you nailed this one. 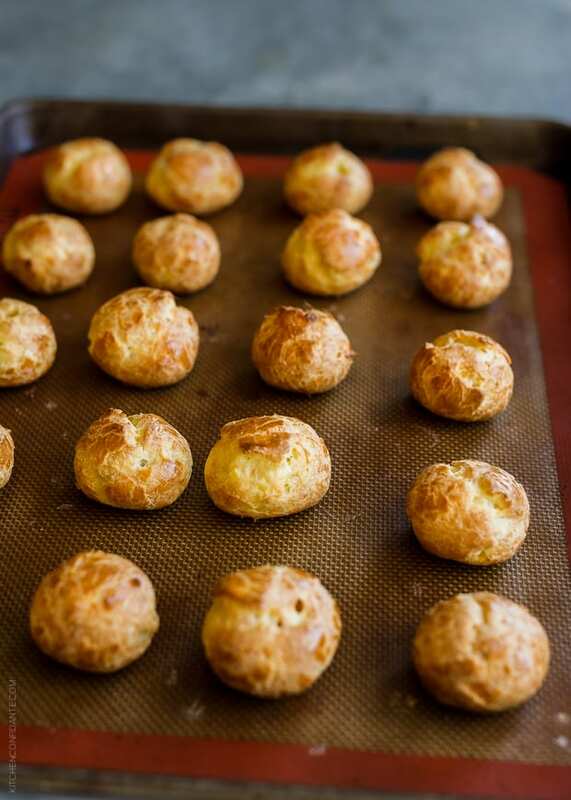 I’ve made gougeres once and I have been thinking that I need to make them again. I think I have to give these babies a try! these look insanely delicious and the pics are absolutely gorgeous !!!!!!!!!!!!! Gougeres are such fun to make and I’m always surprised at how easy they are. What a great idea to use apple cider in the filling! I love gougeres, but there is something rather wallflower about them. Love that this recipe dolls them up in a little black dress and gets them ready for a night out. Love the sound of these…sweet and salty heaven! These look wonderful. I can’t wait to try them with a bit of Cabot Clothbound Cheddar-I bet that cheese would make them even more fabulous than they all ready are. Thanks for a great website!